The Germans are just too obsessed about getting things perfect. If this keeps up, our operations here will go bankrupt. — American manufacturing executive, working in Frankfurt. The Americans are very easy-going and self-confident. But behind that façade, we sometimes find them shallow. They don't always follow up on what they say they are going to do. — German engineering executive, working in Chicago. These two quotes clearly illustrate the stress and frustration American and German executives often feel when trying to cope with each other's culture. The acquisition of intercultural competence is necessary to overcome what can become fatal obstacles. By taking part in this seminar, you'll learn to understand your counterparts' actions and reactions and know how to behave "correctly" in that context. Click here for the seminar design in PDF format. 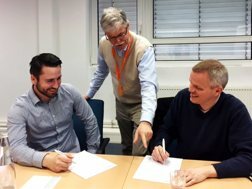 German managers, who will be living abroad as well as those who often communicate and work with foreign colleagues, customers or suppliers, will benefit greatly from this workshop. The premise of this seminar is simple: understanding your culture and your own “mental software” is a prerequisite to understanding other people’s ways and habits. By first clarifying the (unconscious) behavior of the German business person and then comparing this with three important trading partners, U.S.A., China and Poland, the participant attains a competent level of intercultural competency. The language is instruction is mainly in English. The above sums up the basic problem when Germans make speeches in an American environment. In our workshop, you'll not only learn how to best present your ideas to colleagues, senior management and customers, but will also come to understand the intercultural parameter, the needs and expectations of your audience. You'll have the opportunity to work on your general presentation skills and reflect on them in an international context. The bottom line is that you'll become more sensitive of the cultural differences that can break deals and the minute adjustments that can make them succeed. 4 to 8 — Participants are requested to bring along actual (work) presentations. These will be developed and rehearsed. Speeches will then be videotaped for critical review. The focus of this seminar is to show how cultural perceptions can affect a deal's success or failure. At the end of the workshop, each participant will have a clear picture of his or her negotiating style and be given a personal action-plan to implement. Additionally, the Harvard Model for successful negotiation will be discussed and used in role-playing (including scenarios proposed by the participants themselves). Practical ways to discover hidden agendas and counter "dirty tricks"
Our training program is based on a premise that appears simple but is quite complex in its ramifications: understanding your own culture — your own mental software — is a prerequisite to understanding another people's ways and customs. All training, coaching and facilitation interventions are conducted in English, as it has become the lingua franca of the German-American business world. Ironically, this constitutes an advantage for Germans by giving them the chance to practice English in a controlled setting. Seminars can be conducted in German, however, by special request. Role-playing, case studies, team tasks, group discussions and individual reflection are all tools in the learning experience. Additionally, videotapes are used to add variety and attention-span stimulation. It’s a funny thing about life. If you refuse to accept anything but the best, you very often get it. Choosing an intercultural trainer isn't easy. What you're looking for is competence at a fair price.But how do you recognize true competence? It's also important to know what conceptual models of culture will be used and what the seminar objectives are (as seen by the trainer). What are the characteristics of an interculturally-competent person? The answer should not only convince you the trainer knows what he or she is doing, but should sell you on the importance of intercultural training in general. These are five of the most frequently asked questions concerning intercultural training. Click on the question to see the answer. 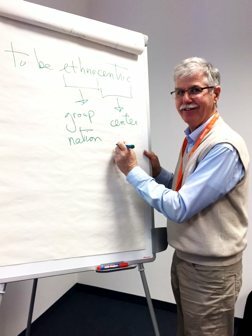 Can a two-day cross-cultural training seminar bring about changes among the participants? Yes, it can! By teaching concepts of culture and stereotyping, as well as the different communication styles of Germans and Americans, people leave the workshop with a whole new way of looking at the world. "Gee, I didn't realize I was so American!" is something I hear a lot of. Likewise, "Mensch, ich wusste nicht, dass ich so deutsch war!" This heightened consciousness is brought about through lectures, group discussions, case studies and role-playing. The participants not only gain cognitive knowledge, but also begin to emotionally experience what intercultural competence really means. According to a recent study on why international joint ventures often didn't succeed, only 30 percent of failures were attributed to problems of planning, technology, finance, etc. — the so-called “hard” factors of business. Fully seven out of ten failures were directly traceable to the behavior patterns of those in management positions — the so-called “soft” factors. What is the real meaning of culture? Culture is a system of assumptions, values and meanings, shared by a specific group to help deal with the problems that life presents. In another words, it is "the collective programming of the mind". From the day we're born, we begin learning a cultural system. By the time we're young adults, the socialization process is so deeply ingrained that we're unaware of the power culture exerts on our perceptions and behavior. Why is intercultural communication different from that in the normal workplace? Assume you're a German working in a German office. Because of your upbringing, you automatically — and unconsciously — share a lot of values and assumptions with your colleagues. These are social reflexes and they affect everything from basic attitudes and behavior to facial expressions, body language and, of course, words. If you were to find yourself in an American environment, however, not only would you not share the same mother tongue, many of your ideas about proper communication would be "wrong". For example, it's considered normal in Germany to flatly state that a co-worker is making a mistake. "That is the wrong way to do it. You are doing it backwards." It's not personal, it's just that errors should be avoided. Most Americans react defensively to such direct criticism, even when they know they're wrong. In the U.S., that translates as "Why is this German so hard-hitting and harsh. Doesn't he know what diplomatic means?" Not surprisingly, Germans don't understand why American bosses are always complimenting their employees on a "job well done". It would be abnormal for the job not to be done well. Americans and Germans seem quite similar. Why are there so many intercultural problems? Despite wave upon wave of immigration, dating back to the middle of the 19th century, American culture retains its Anglo-Saxon background. And the latter half of that equation — Saxony — is, of course, a region in eastern Germany. This means Americans and Germans are similarly pragmatic in the way they do business. Both cultures are monochronic, concentrating on one activity at a time. Both value punctuality and are results-oriented. Because of these common traits, Germans and Americans expect each other to think and behave the same. Except they don't. This is what what intercultural trainers call the “trap of similarity”. An example of how differently Germans and Americans think - and how important these differences can be — concerns the role of manager. Americans think the job consists of motivating workers, controlling quality and making sure a job is done properly. Germans expect a manager to distribute tasks, then take a hands-off approach. In Germany, workers are trained to solve problems themselves; tasks are seen as a challenge to their acquired skills. That some person should have to “motivate” them is an insult to their professional pride. Because that simple term — manager — was not understood (and because no intercultural training was done), Volkswagen's attempt to set up a “Rabbit” assembly plant in Pennsylvania in the early '80s was doomed from the beginning. The managers, from Germany, assumed American workers were as well-trained as their German counterparts. But American auto-workers don't spend a couple of years in technical school, aren't privy to the world-famous German Dualsystem. They normally don't expect to take the initiative, nor do they anticipate that their manager will only give them instructions, making them responsible for creative problem-solving. Assembly-line jobs are seen as bottom-rung employment, albeit well-paid. In the end, these new Volkswagen workers felt "ignored" by their foreign managers and were happy to do as little as possible. The result was, not surprisingly, a shoddy product. The plant was eventually closed. Nearly a billion dollars was lost. Fifteen years later, Walmart's efforts to establish a foothold in Germany have been running into severe intercultural problems. Unilingual American managers were parachuted in and immediately bought a chain of stores, transforming them into WalMarts. Not knowing the real estate market, they paid, according to Manager Magazin, twice what they should have paid. They also insisted on applying American methods with German employees. This has exacerbated the well-known schism — collectivism versus profit-as-king — between German and American business philosophies. Finally, the American managers were replaced with a German CEO, but according to Manager Magazin, four years in Germany have cost Walmart a billion dollars. A final note regarding the trap of similarity: watch out for what I call “the perversity of fluency”! Germans, as a whole, are very good with foreign languages and virtually any educated person speaks English well. Also, thanks to American film and television, not to mention pop music, Germans usually understand both “the king's English” and U.S. slang. But being able to imitate John Wayne doesn't make you a cowboy. Many German executives have lived and worked in the U.S. and their English doesn't sound so much "foreign" as vaguely British, a hint of Yale or Princeton perhaps. Nonetheless, they remain German in the way they think and act. They are unlikely to clap you on the shoulder while shaking hands and will probably cringe if you slap them on the back while laughing at a good joke. In fact, while they may laugh, they may not find the joke particularly amusing.